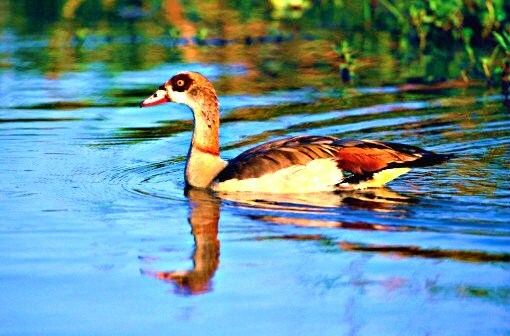 The Egyptian goose (Alopochen aegyptiacus) is a large, distinctive, pale-coloured waterbird which is easily recognized by the conspicuous dark chocolate-brown patch around its eye. The head and neck are pale buff, and there is another dark brown patch around the base of the beak, usually joined to the eye patch by a narrow line. The Egyptian goose has buff-coloured underparts, which become paler on the flanks and belly, and a variable but distinctive chocolate-brown patch on the lower breast. The upperparts usually vary from reddish- to grey-brown, with a black back, rump and tail, while the crown and back of the neck may show dark mottling, sometimes appearing reddish-brown. There is a narrow, dark reddish-brown collar around the base of the long neck. The ends of the wings are black and bear an iridescent green speculum, which is separated from the contrasting white forewings by a narrow black line. The Egyptian goose has pinkish legs and feet, which become redder in the breeding season. The eyes are orange and the beak is pink, with a black tip, black nostrils and black edges. The female Egyptian goose resembles the male, but is smaller and often has darker markings on the beak. The sexes can also be distinguished by their calls, the male giving a strong but hoarse hissing sound while the female gives a harsh, trumpeting quack. Juvenile Egyptian geese are duller in colour, with a grey tinge on the forewings, a darker crown and neck, and a yellowish beak and legs. Juveniles also lack the distinctive dark eye and breast patches of the adult.